Kubomatsu Katsukiyo (久保松勝喜代, The Great Amateur, 1 January 1894–15 December 1941) was a Japanese, professional 7-dan, who was posthumously awarded professional 9-dan status by the Nihon Kiin and Kansai Kiin 67-years after his death. His disdain for opening convention (which earned him the nickname The Great Amateur) led to many innovations in the shin-fuseki period, including his two-year directed study into tengen. In the Kansai area he discovered and nurtured the talent of a number of great players, such as Kitani Minoru, Hashimoto Utaro and Maeda Nobuaki, thereby significantly influencing the history of go in the 20th century. He was an 8-dan renju player (five-in-a-row) and inventor of the ninuki renju? variant. Also, there is the matter of the late, great master of the Osaka area, Kubomatsu Katsukiyo. Master Kubomatsu's flair was for creating immense stretches of territory in the center. If one has the opportunity to play out a game of this master of old, it is recommended that one do so. 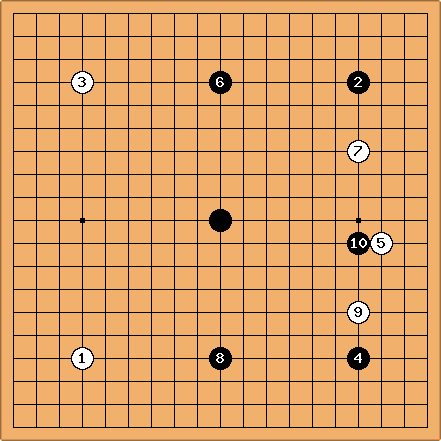 Go no Jousiki 碁の常識 ' Common Sense in Go' (1929), a treatise on basic tactics. Kutou Juusannen 苦闘十三年 ' Struggling Thirteen Years (1940), 41 of his commented games in Oteai and some articles on their circumstances. Source: John Fairbairn's article, "Kubomatsu's Central Thesis" (11 June 2000) from the now defunct Mindzine.